Hard Drive Capacity 16GB. BOX CONTAIN: TABLET, USB DATA CABLE, NO ADAPTER. Type Tablet. Family Line Galaxy Tab 3. Display Max. Resolution 1280 x 800. Display and Screen. Processor Speed 1.6 GHz. The Tab 10.1 features Android 4.3 Jelly Bean. Intuitive at every turn. FREE USB Charging Cable (where applicable). The device has been fully tested and is in perfect working order. Superior sound. FREE 3 Month Warranty. Ex-display tablet show some slight marks and glue on back cover, tablet comes in ordinary box with data cable. Box Contents: Tablet , Data cable Technical Details Brand Samsung Item Weight 508 g Product Dimensions 24.3 x 0.8 x 17.6 cm Item model number GT-P5210 Series Galaxy TAB 3 10.1 P5210 16GB Color Gold Brown Screen Size 10.1 inches Processor Brand Intel Processor Type Atom Processor Speed 1.6 GHz Processor Count 2 RAM Size 1 GB Computer Memory Type DDR3 SDRAM Hard Drive Size 16 GB Graphics Chipset Brand PowerVR Graphics Card Description Integrated Connectivity Type Wi-Fi Wireless Type 802.11B, 802.11G, 802.11n Operating System Android Average Battery Standby Life (in hours) 10 hours Average Battery Life (in hours) 7 hours Lithium Battery Energy Content 6. Google Nexus 10 Tablet - 16GB, Wi-Fi, 10in - Black. This Wi-Fi-enabled Google Nexus tablet PC displays places across the globe in 3D through Google Earth. Model Nexus 10. Type Tablet. Resolution 2560 x 1600. Model: Galaxy Tab3 7.0. 6GB Storage. Android Tablet. Briefly function tested. Power tested and touch screen works and goes to settings OK. Item has been erased using BLANCCO software and reset to factory settings. Samsung Galaxy Tab 3 GT-P5210 16GB, Wi-Fi, 10.1in - White (GT-P5210ZWVBTU). Condition is Used. Dispatched with Royal Mail 1st Class. Has had screen protector on all the time. Very good condition. Good working order. However Loses battery often. So had a often charge. If the battery was changed it’d be as good as new. *Re-Listing due to time waster* I would have done a second chance offer but eBay is giving me an error when I try. Samsung Galaxy Tab 3 GT-P5210 16GB, Wi-Fi, 10.1in - Black. Condition is Used. Dispatched with Royal Mail 2nd Class. Samsung Galaxy Tab 3 GT-P5210 16GB, Wi-Fi, 10.1in - Gold Brown. Condition is New. Dispatched with Royal Mail 1st Class. Samsung Galaxy Tab 3 GT-P5210 16GB, Wi-Fi, 10.1. Apart from a wide range of features, it has Wi-Fi connectivity for internet browsing. This tablet weighs 0.5 kg (1.12 lb.). You are looking at aSamsung Galaxy Tab 3. Model Galaxy Tab 3. Type Tablet. Storage Capacity 16 GB. Samsung Galaxy Tab 3 GT-P5210 16GB Wi-Fi 10.1in - White. Samsung Galaxy Tab 3 GT-P5210 16GB Wi-Fi 10.1in - White. Condition is Used. Fully working, no scratches or dents on the screen or back cover. Battery life is still great. Will post with the cover that I have for it, able to double up as a stand. Selling as I've bought a new tablet. Will be factory reset before sending. 4 out of 5 stars - Samsung Galaxy Tab 3 GT-P5210 16GB Wi-Fi 10.1in - White. 65 product ratings65 product ratings - Samsung Galaxy Tab 3 GT-P5210 16GB Wi-Fi 10.1in - White. Exdisplay working tablet show some slight marks front and back, tablet comes in ordinary box with data cable, no adapter supplied.Box Contents: Tablet , Data cableTechnical Details Brand Samsung Item Weight 508 g Product Dimensions 24.3 x 0.8 x 17.6 cm Item model number GT-P5210 Series Galaxy TAB 3 10.1 P5210 16GB Color Black Screen Size 10.1 inches Processor Brand Intel Processor Type Atom Processor Speed 1.6 GHz Processor Count 2 RAM Size 1 GB Computer Memory Type DDR3 SDRAM Hard Drive Size 16 GB Graphics Chipset Brand PowerVR Graphics Card Description Integrated Connectivity Type Wi-Fi Wireless Type 802.11B, 802.11G, 802.11n Operating System Android Average Battery Standby Life (in hours) 10 hours Average Battery Life (in hours) 7 hours Lithium Battery Energy Content 6. 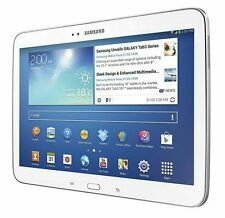 Samsung Galaxy Tab 3 GT-P5210 16GB, Wi-Fi, 10.1in - White. GOOD CONDITION, GRADE B, WORKS PERFECTLY. Grade BCondition, working perfectly. Storage: 16GB. Model: Galaxy Note GT-P5110. Manufacturer Colour: Pearl White., 1000% Happy With Item. Happy to buy from again -30thdegree. We can only apologize for this, and hope this does not cause you any problems. 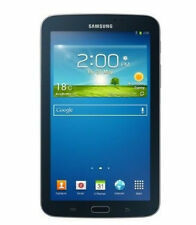 Running on Android 4.0 OS, this Samsung Galaxy Tab 2 allows you to access various interesting Google applications. Model Galaxy Tab 2. Type Tablet. Battery Technology Lithium Ion. Storage Capacity 16 GB. 1x Samsung Tablet P5210. BATTERY Non-removable Li-Po 6800 mAh battery. Loudspeaker Voice 71dB / Noise 73dB / Ring 75dB. MISCColors Black, White. 1x USB Data charging cable. Audio quality Noise -91.5dB / Crosstalk -90.5dB. EX-DISPLAY TABLET SHOW SOME SLIGHT SCUFF MARKS FRONT AND BACK. TABLET COMES IN ORDINARY BOX WITH DATA CABLE, NO ADAPTER SUPPLIED. BOX CONTENTS: TABLET , DATA CABLE, SPECIFICATIONS: Brand Samsung Model SM-T310 MPN SM-T3100ZWABTU Type Tablet Family Line Galaxy Tab 3 Display Size 8in (20.32 cm) Hard Drive Capacity 16GB Operating System Android Internet Connectivity Wi-Fi Processor Speed 1.5 GHz Display Max. Resolution 1280 x 800 Rear Camera Resolution 5 megapixel Expandability microSDXC Expansion Ports 3.5mm Earphone Jack, USB 2.0 Width 21 cm (8.26") Special Features Built-in Front Camera, Built-in Rear Camera, Colour Screen, Email, Integrated Speakers, Touch Screen, Video Recorder, Web Browser NOTE: The SALE is subject to section 50A of the VAT Act 1994 and the VAT special provisions order 1995. A marginal SCHEME applies. He Samsung Galaxy P-7510/M16 remains one of the top contenders in the tablet war. Model Galaxy Tab. Type Tablet. Touch Screen Technology Multi-Touch. Storage Capacity 16 GB. Colour White. Manufacturer Colour Pure White. EX-DISPLAY GRADE A TABLET MAY SHOW SOME SLIGHT SCUFF MARKS, TABLET COMES IN ORDINARY BOX WITH DATA CABLE, NO ADAPTER INCLUDED. BOX CONTENTS: TABLET, DATA CABLE TECHNICAL DETAILS: Type: Tablet Dimensions: 209.8 x 123.8 x 7.4 mm (8.26 x 4.87 x 0.29 in) Weight: 314 g Displaysize: 8" 1280 x 800 pixel Displaytype: TFT capacitive touchscreen, 16M colors Memory int. : 16 GB Card slot: yes up to 64 GB Keypad: full touch Camera: 5MP, 1.3MP Secondary Connectivity: Bluetooth, Wi-Fi, Wi-Fi Direct, dual-band Features: GPS with GLONASS CPU: Quad-core 1.5 GHz Oper.System: Android 4.2.2 (Jelly Bean) NOTE: The SALE is subject to section 50A of the VAT Act 1994 and the VAT special provisions order 1995. A marginal SCHEME applies. Non-removable Li-Po 6800 mAh battery. Voice 71dB / Noise 73dB / Ring 75dB. Audio quality. Contrast ratio: 917 (nominal). About 260 EUR. 0.83 W/kg (body). 2.0, USB Host. Wi-Fi 802.11 a/b/g/n, dual-band, Wi-Fi Direct, hotspot. WiFi enabled and complete with speakers, this tablet is the perfect fit to a travelling lifestyle. 16GB internal storage. Up to 8 hours battery life (depending on usage). Flash 11 Support. General features. Samsung Galaxy Tab 3 GT-P5210 16GB, Wi-Fi, 10.1in - White (GT-P5210ZWVBTU). Condition is Well Used and still in great mint with a protective cover shown in the pictures. Comes from a Smoke and pet free home. Offers are welcome. Google/HTC NEXUS 9 Tablet 8.9” Display 16GB Storage 2GB RAM Wi-Fi Android 7.1.1. • Auto updates. With Nexus 9 you’ll be among the first to get new Android updates from Google. This device is currently running on Android 7.1.1. Nexus 9 joins your entire family of Android devices with seamless integration. 1.4GHz Dual-Core ARM Cortex A9 MP Core processor. HP Slate 7 2800 Tablet. HP Slate 7 2800 (Wifi/8GB/Silver). Beats Audio Settings. HP Software HP ePrint App. HP Native Android Print technology. HP Wallpaper. Has very good battery. Tested before sale - In full working order. 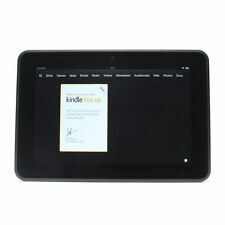 Amazon 3HT7G Kindle Fire HD 8.9" Tablet - Wifi. Black 32GB. Free cloud storage for all Amazon content. MP4/VP8/H.263 player. MP3/WAV/AAC/OGG/E-AC-3 player. BATTERY Non-removable Li-Ion battery. MISCColors Black. Used kindle in good condition. Very good physical condition with no marks or scratches. Model: Nook BNTV250. MPN: BNTV250. Storage: 16GB. TYPE: PC Tablet. Manufacturer Colour: Silver. Processor Speed: 1GHz. Light Wear and Tear on screen and bezel ~. Light Wear & Tear on back casing ~. Samsung Galaxy Tab 2 7.0. Processor 1000 MHz. Card reader microSD, 32 GB. Display 177.8 mm (7 ), 1024 x 600 pixels, multi-touch. Networking 802.11b, 802.11g, 802.11n, 3.0. Connectivity 3.5 mm. Model Galaxy Tab 2. Model: RDJ21WW. The BlackBerry PlayBook has 1 GB RAM to enhance the processing speed. With Wi-Fi connectivity, this BlackBerry tablet lets you surf the internet even when you’re traveling. If you have a blackberry phone you will love the BlackBerry Bridge which allows pairing with a BlackBerry Smartphone for internet browsing and more! AMAZON KINDLE FIRE HD 3RD GEN. MAKE & MODEL. Model: KINDLE FIRE X43Z60. MPN: X43Z60. Storage: 16GB. Connectivity: WIFI. Product Family: Tablet PCs. We can only apologize for this, and hope this does not cause you any problems. Colour: BLACK. Item Details.